I don't do gear reviews. Most of the gear reviews on the internet are fairly useless and I don't want to contribute to that mass. There are of course exceptions to this, but for me it would take a long time to test something thoroughly enough to give an honest and accurate review, and then the gear item in question would probably no longer be on the market. 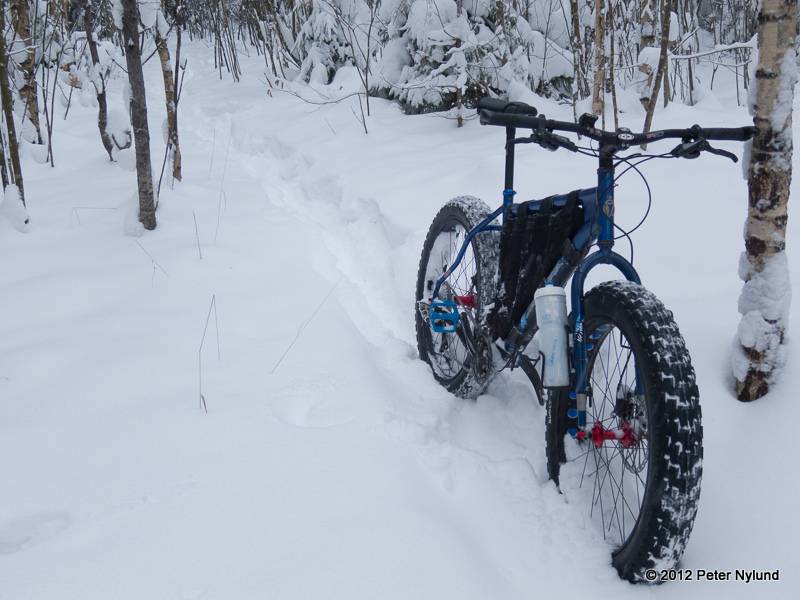 This writeup is a good example of that: I now have enough snow time on my 2012 Salsa Mukluk to give my assessment of it, but the 2013 model differs from the 2012 in several important geometry properties. I had the Surly Pugsley for a little less than two years until I replaced it with a 2012 Salsa Mukluk a little less than six months ago. A good overview of the differences in geometry between theses two can be found here. I'm talking about geometry here, since my bikes have been built up from components and I have no idea how the manufacturer complete builds compare. The biggest difference between the Pugsley and pre-2013 Mukluk is that the Mukluk has a more stable, and hence slower, steering. The Mukluk also has a lower bottom bracket, giving a lower center of gravity, and longer chain stays for even more stability. For summer trails this should theoretically mean that the Pugsley would be more agile on the summer trails, but since my Pugsley was built up like an expedition tank compared to my lean and mean Mukluk, I won't comment much on that. I think the Mukluk worked very well on the summer trails for me, also in very technical places. The more stable steering of the Mukluk did feel better than that of the Pugsley when fully loaded, though. My Pugsley as an expedition tank. 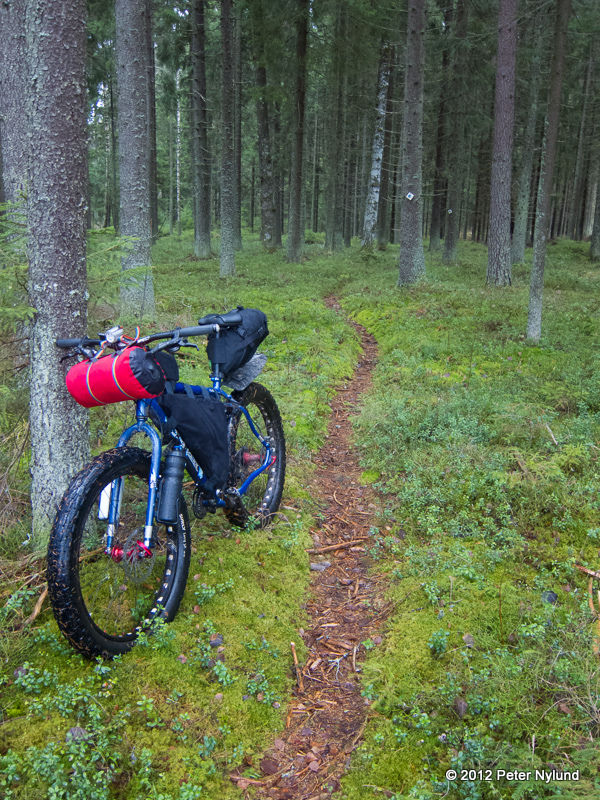 The Mukluk equipped for an overnighter. The Mukluk in summer trail mode. For the winter, the summer wheels (47 mm trial rims with 3.8" Larry tires) where swapped out to fatter tires and rims (82 mm drilled Rolling Darryl with 4.7" Big Fat Larry tires). 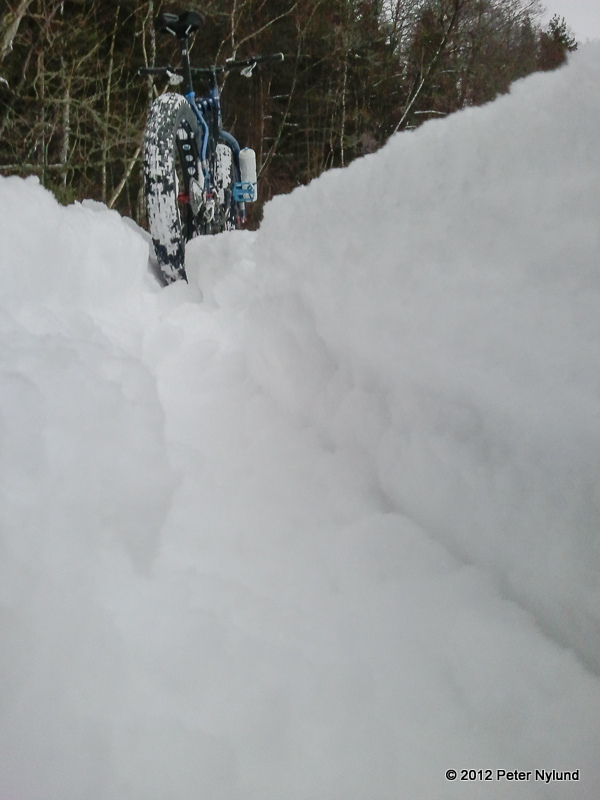 During the last few weeks we have received a good amount of snow and there have been plenty of opportunities to see how the Mukluk geometry works in the snow. Big Fat Larry with low snow pressure. Note how the tire deforms. This makes it roll like a tank on a hard surface, but distributes the pressure over a large area in snow. 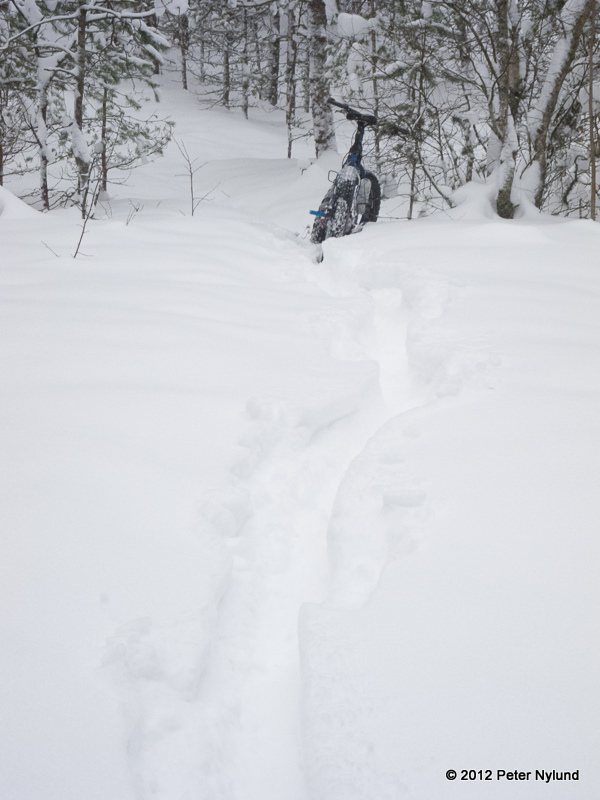 The stability of the Mukluk in difficult snow conditions, like new snow on top of a semi-soft trail, is really noticeably better than that of the Pugsley. 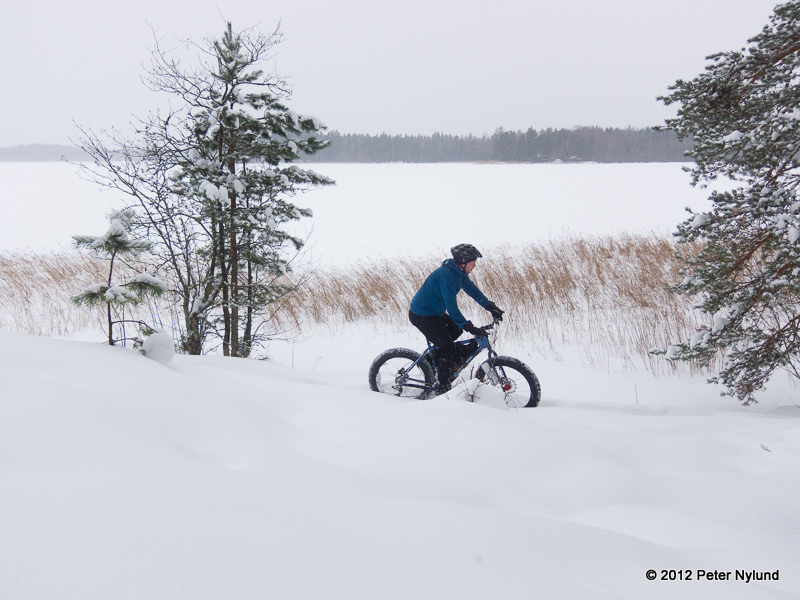 The Pugsley always felt a bit twitchy in these conditions. 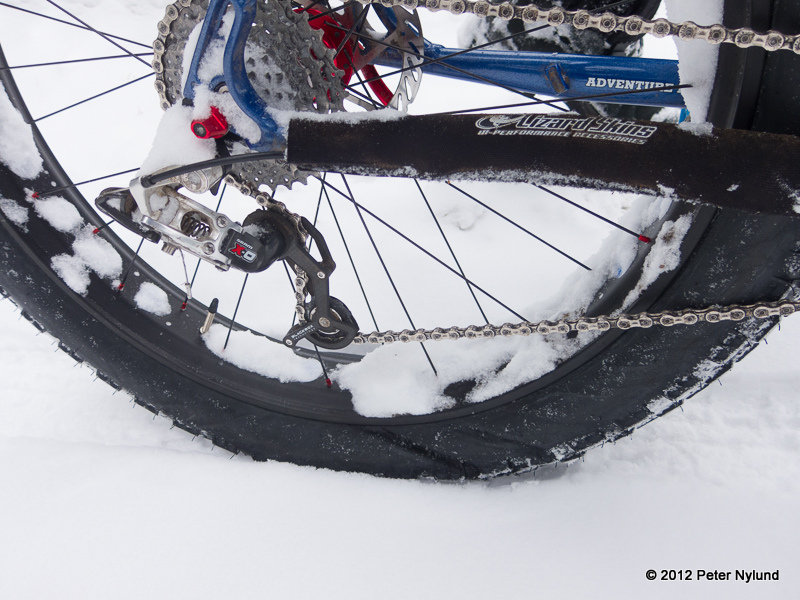 The Pugsley could probably have been a bit more stable by having the rear wheel as far back as possible in the sliding dropouts, essentially making the chain stays longer, but the Mukluk still has the lower bottom bracket and slacker head tube angle going for it in snow. Going in deep snow there are probably no big differences, but the stability might again help. Now aside from these geometry differences, there are some other aspects to be aware of as well. 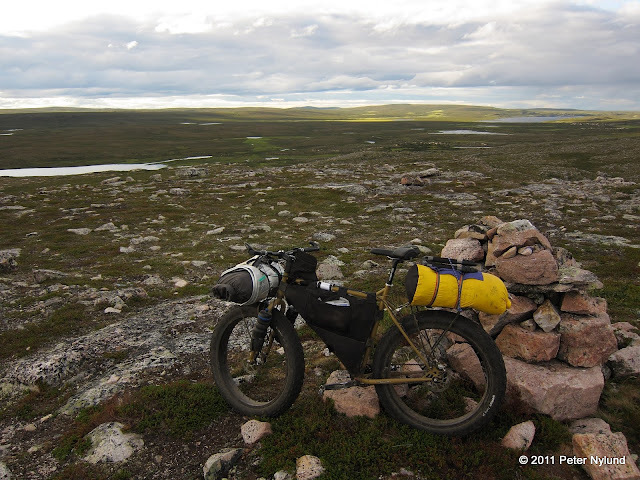 The Pugsley is made of steel, making it heavier that the aluminium Mukluk. Some people talk about the feel of steel, but I don't think I would be able to detect the differences when there already is a good amount of tire dampening vibrations from the trails. A big advantage of the Mukluk is the 170 mm rear, which makes it possible to use light trial rims for summer wheels while maintaining a good wheel strength. This is also a disadvantage compared to the Pugsley, since the Pugsley with its 135 mm offset design makes it possible to swap the front and rear wheels, which could come in handy if e.g. the freewheel decides to fail while you are far away from the civilization. The Pugsley also has room for Surly's new 29x3" tire/rim combo, which certainly would be interesting for the summer. It won't fit the 2012 Mukluk. Both bikes have a big main triangle, allowing a good sized frame bag. For shorter people the standover might be an issue, but being 192 cm tall I've never had to worry about that. 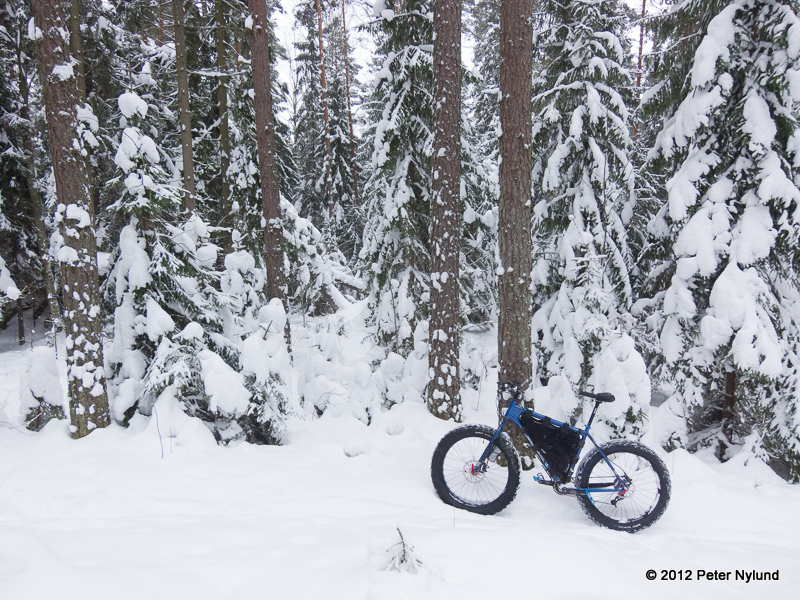 The bottom line is that I think that for winter use, the Mukluk has some advantages over the Pugsley. These observations of mine are probably only relevant for someone of my height, since I don't think the geometry properties of a bike are consistent between sizes, when such a big part of the bike/rider system is the rider. 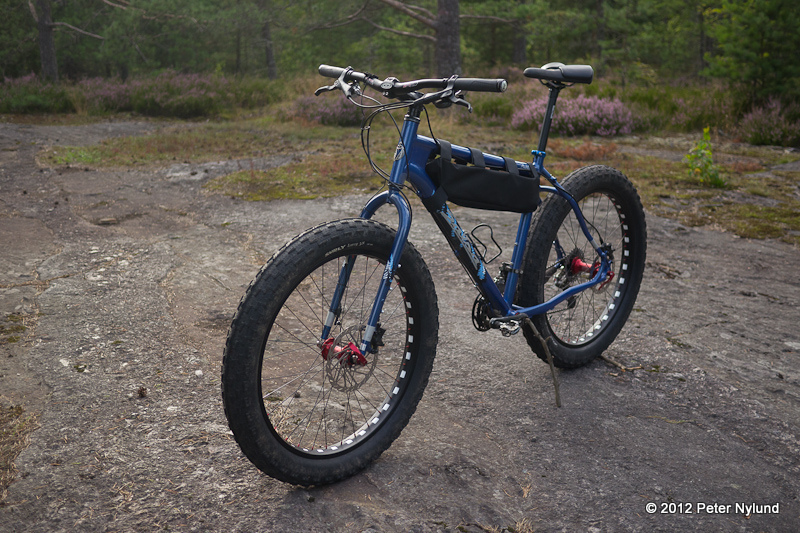 Also, remember that the 2013 Mukluk differs from the 2012 version.